This is the seventh blogpost of the Irish Parenting Bloggers’ #BlogMarch across 10 blogs over 10 days. 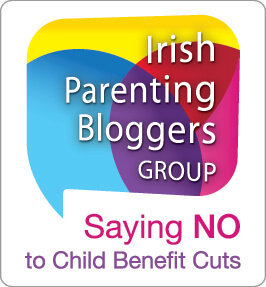 The aim of the BlogMarch is to protest against the proposed Child Benefit cuts in Ireland. We all have varying opinions and beliefs as to what should happen but we are united in our belief that Child Benefit shouldn’t be radically cut. Those who know me well know that I’m not short of an opinion or a hundred when it comes to current affairs but generally I tend to separate them from the blog. If you read my blog regularly you will know that we live on a tight grocery budget. It currently stands at €90 a week for a family of 5. If the child benefit were to be cut the next logical step for us will be to cut this grocery budget. This is a huge concern for us. Having money brings the freedom to make choices. The less money we have the less options we are left with when it comes to food. If I wanted to I could go to the local large supermarket right now and fill up my trolley with convenience foods, enough to feed the family for a week. Chorleywood proved breads, pizza, reformed breaded chicken, oven chips, biscuits, cake and other high calorie unhealthy foods. I could fit all of these products into my trolley for cheaper than I do my fresh vegetables, Irish meat and produce so that I can create wholesome, nutritious meals for the family. Stress can be paralysing at times and when faced with a choice between a discount frozen pizza for €1.89 or the makings of a dinner for €5 I can see why parents choose to buy a pizza. Especially when they don’t have the €5 to make the dinner either. Is this how far removed from reality we are? As a country we are facing a rising obesity epidemic. How much of that is due to the easy access to convenience foods? Speaking to good friends over the past few weeks about the prospect of losing a significant portion of the child benefit payment; I’m seeing black shadows under eyes, a tightening of the jaw when we discuss money matters. I’m told I appear the same. Do the Government have to make savings? Yes of course they do. I support making reasonable savings and cuts. Have the Bondholders had to take a cut? There are other options when dealing with the delicate topic of Child Benefit and other Benefits and Allowances distributed by the Department of Social Protection. Top of the list is means testing which apparently would be too costly to implement. However the HSE has be successfully means testing medical cards for years but the 2 departments aren’t linked. Does this make sense? The fact that means testing for Family Income Supplement is typically a simple analysis of income versus the limit means that there are families paying high rents or mortgages who are in a worse financial situation than those who are living with little or no housing costs. Is this fair? If you’d like to hear me get up on my high horse, swear and blaspheme (sorry) a bit then you can listen to this week’s edition of the not-so Wholesome Bites here. You can read each daily post from all walks of Irish Parenting Life here. If you’d like to lend your support, you can sign the online petition here. You can also share your thoughts with us on Twitter at #BlogMarch or Like our Facebook page. That’s a perfectly reasonable idea Kathryn. It’s a pity that reason seems to be going out of the window lately…..
For some reason I thought it was only in the US that convenience food was cheaper than “real” food, thus driving the obesity epidemic. One of the best things about coming home, for me, and one of the things I fantasise about when wondering if we’ll ever live in Ireland again, is the quality of the food. But if we couldn’t afford any of it … huh. Certainly not Maud. It’s a huge issue here as well. I love this post. You are living the problem areas that the government seem to have difficulty understanding and you are explaining them in simple terms. I have also noticed the difference between buying healthy food to ‘make’ meals and buying prepackaged products as meals.It doesn’t make sense. These posts also show the rest of us that we are not alone. Thanks for this. No, we’re not alone. There are hundreds of thousands of families in the same situation. We are eating cheaper already. No more organic, everything from Lidl, no more farmers market and lots more convenience food. You’re right on the money here. As are we. It’s just a pity that we have to continue to pare from the grocery budget. Why this isn’t means tested in the current climate I do not know. A cut across the board is the least equitable outcome imaginable. It is really. I can’t believe so many departments deal with similar information and don’t communicate with one another!